Skiptracing (also skip tracing, or debtor and fugitive recovery) is the process of locating a person's whereabouts for any number of purposes. A skip tracer is someone who performs this task, which may be the person's primary occupation. The term "skip" refers to the person being searched for, and is derived from the idiomatic expression "to skip town", meaning to depart (perhaps in a rush), leaving minimal clues behind to "trace" the "skip" to a new location. Skip tracing tactics may be employed by debt collectors, process servers, bail bond enforcers (bounty hunters), repossession agents, private investigators, attorneys, police detectives, and journalists, or by any person attempting to locate a subject whose contact information is not immediately known. Similar techniques have also been utilized by investigators to locate witnesses in criminal trials. Skiptracing is performed by collecting as much information as possible about the subject. The information is then analyzed, reduced, and verified. Sometimes the subject's current whereabouts are in the data, but are obfuscated by the sheer amount of information or disinformation. Often, the job becomes more than mere research since one must often employ methods of social engineering, which involves calling or visiting former neighbors, or other known contacts to ask about the subject, sometimes under false or misleading pretenses. 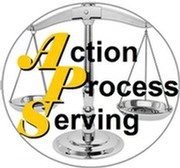 Records that Action Process Serving use may include phone number databases, credit reports (including information provided on a loan application, credit card application, and in other debt collector databases), job application information, criminal background checks, utility bills (electricity, gas, water, sewage, phone, Internet, and cable), social security, disability, and public tax information. While some of these records may be publicly available, some cannot be accessed without appropriate authority. Even when no specific information is returned, public and private databases exist that cross-reference skip tracing information with others the "skip" may have lived with in the recent past. For instance, if previous records show a "skip" lived in the same house as a third party, the third party may also be "skip traced" in an effort to locate the "skip".